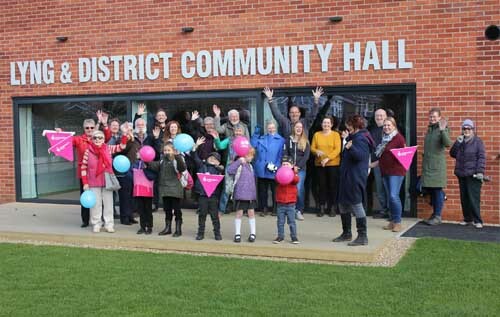 After more than 20 years of fundraising, campaigning and hard work, the new Lyng and District Community Hall will open to the public on Saturday 6 April at 10 am. Serving the communities of Lyng, Sparham and surrounding parishes, the new community hall provides much improved facilities in the heart of the Wensum Valley after the demolition last year of the old, post-war hall that had reached the end of its life. Work started on the new hall in 2017 and has been completed on time for a launch this weekend. The project was supported with funding from the National Lottery Community Fund, the largest funder of community activity in the UK. Located in Richmond Place, Lyng, the hall offers modern facilities, including full disabled access, a large hall and a smaller meeting room. Bookings are already being made, and there is expected to a be a full programme of events and activities on offer for all sectors of the community, including table tennis, badminton, tai chi, Pilates, Zumba, bingo, line dancing, baby yoga, toddler book club, dog training and a family support group. Peter Lambley, chair of trustees, commented: “We are very proud of what has been achieved and the final result is a great building that will become an essential part of the local community. “We are particularly grateful to the many volunteers that have provided countless hours of their time and expertise to deliver this great result.